As Agent of Change, the youths should take a role to make Indonesia be better. "The Youth's Role in Achieving Indonesia's Sustainable Development Goals 2030"
✔The participant pays the registration fee through transfer with the fee 60k/script. ✔The participant is pleased to do the confirmation to this phone number 0852-7594-8641 (Asrita Sari) for notifying that she/he has sent the manuscript no later than 24 hours. ✔The registration form and declaration of originality are attached in competition guidelines. Well, what are you waiting for? 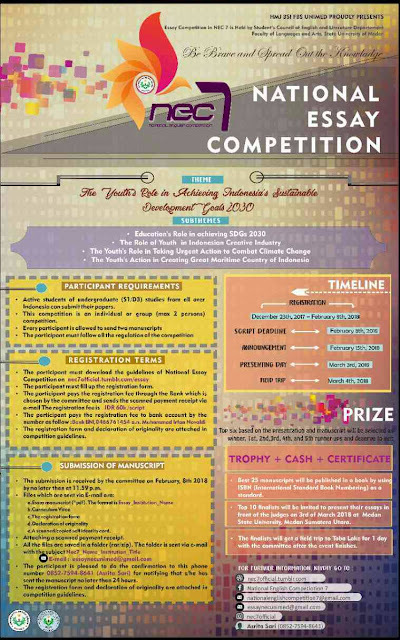 Let's join this National Essay Competition 7 and take a role to achieve SDGs 2030!